It was still early when the garden erupted. The eruption woke me up. I lay still for a few moments trying to rationalise the sound through the dregs of sleep. It was familiar, yet with an unfamiliar cutting edge to it. Then I came to and recognised it. Sparrows. This has been a vintage year for house sparrows in my neck of the woods. The shrubs, the house itself (thanks to the odd loose roof tile offering ghetto-like nesting opportunities) and a well-stocked bird feeder have conspired to spectacular effect. The most I have counted at any one time is thirty-three sparrows, but there could easily be twice that number. 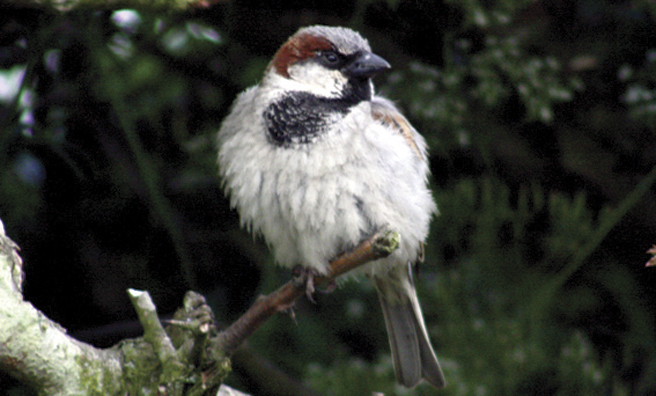 Ornithologists in many parts of Britain seem to think that sparrows are in drastic decline. Maybe they’re all here. They line up on the fence all facing the same way, like a newsreel of a line of dusty refugees from a desert land. They dust-bathe in the bare-earth patches without changing colour. They panic en masse at the least excuse into the honeysuckle, and moments later they cluster as thickly as grapes on a vine around the peanuts and the seeds, the source of the panic forgotten, if indeed there was a source at all. And all of that unfolds to the accompaniment of a more or less constant, more or less day-long, companionable sparrow-chatter. The bird-feeder appears to be the centre of their small universe, and because the windows have been open for much of the summer, their discordant, percussive symphony has drifted indoors for months now, and become a part of the fabric of the place. There have always been sparrows here, but not like this. This year with its sudden spring-into-summer created optimum conditions for wild flowers (oceans of buttercups, knee-high forests of orchids, flowing lava of poppies), wild fruit (blaeberries, raspberries, rowan berries in colossal abundance), butterflies (a sudden and late burgeoning) – and, apparently, house sparrows, too. Of course, the downside to abundance is that the havoc-wreakers also prosper. So it was that early morning when the garden erupted. I have never heard so many sparrow voices raised to such a cacophonous pitch. As I tried to un-fog my brain and focus on the sounds of such turmoil, I realised that something was amiss. I got up and inched open the curtains. The sound came from the depths of the honeysuckle, which rocked and throbbed with sparrows in torment. But there was only one sparrow in sight. One sparrow, and one sparrowhawk – the havoc-wreaker. The hawk was on the grass a couple of yards from the bird feeder. The sparrow was under its right foot, and it was being methodically decapitated. 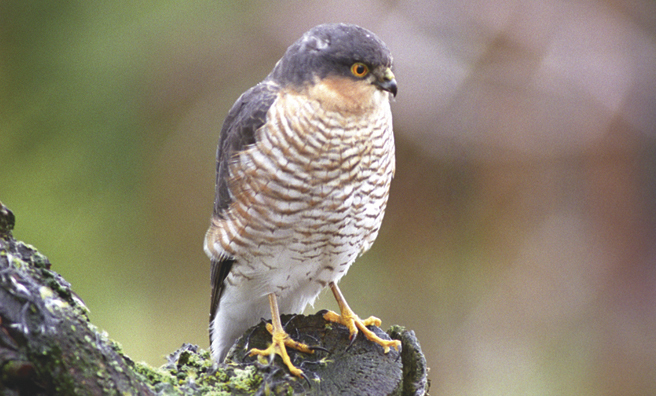 Sparrowhawks like their meals headless before they start eating. I sympathise. I feel much the same way about eating fish. 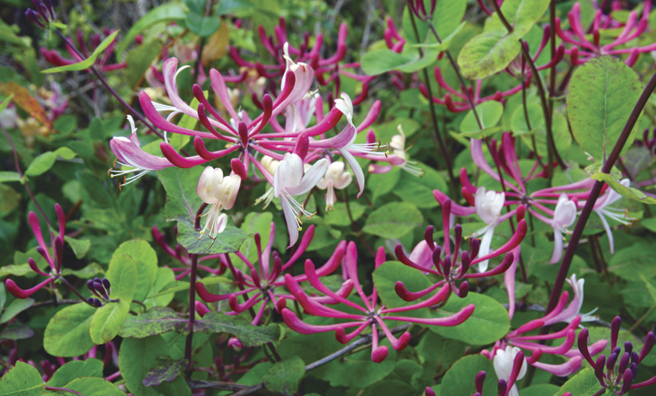 The honeysuckle poured out its fury, without revealing so much as a single sparrow feather. Imagine the inside of that bush at that moment, the helpless, hysterical mob, huddled in the green half-light, safe for the moment as any sparrow can ever be in a land that also allows sparrowhawks and magpies and cats and peregrines and… oh, all the other small bird tormentors that nature has invented as a means of linking its myriad chains into a coherent whole. The theory is safety in numbers, except that the numbers inevitably diminish one by one. 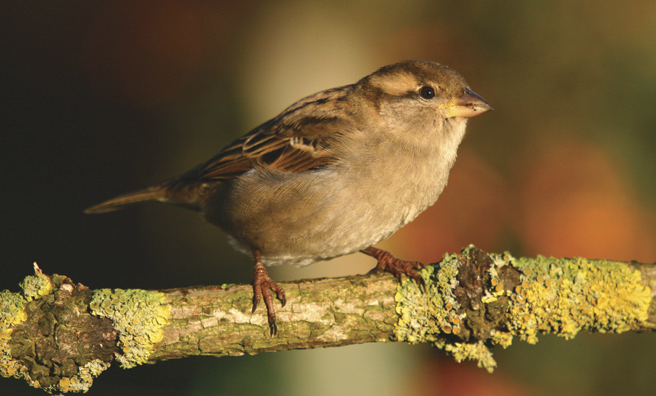 This year of all years, the sparrows can live with that – most of the sparrows, that is. The hawk was big and brown, flecked with white, still downy around the edges, the plumage of a young female. 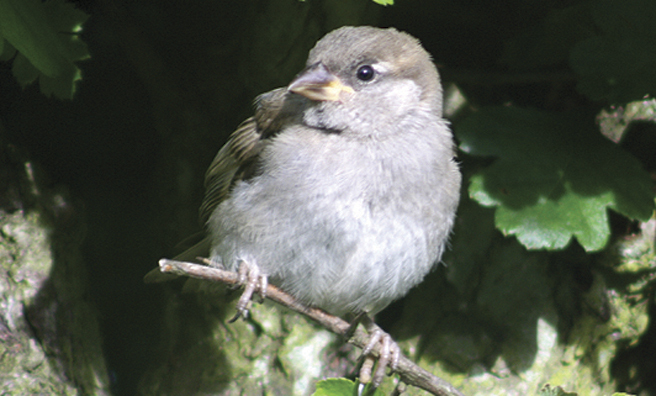 The sparrow looked like a youngster too, although it was getting more difficult by the moment for certainties. That spectacle on the grass is one of the most frequent prey-predator encounters in Western Europe, the house sparrow and the sparrowhawk. It is as routine as the elk and the wolf in Yellowstone, the wildebeest and the lion in the Serengeti, one of the fundamentals of the natural world. 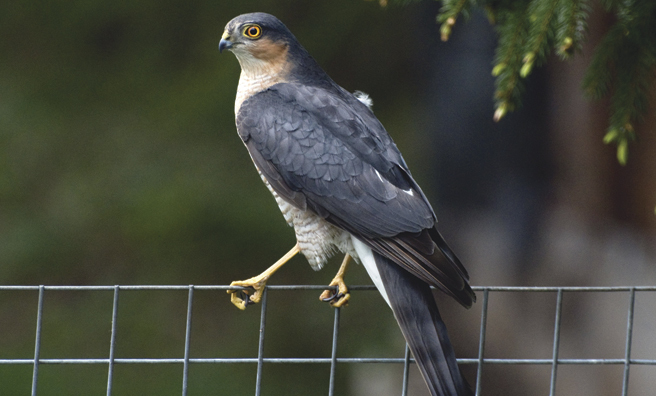 Just one continental study a few years ago revealed that sparrowhawks killed eight in every one hundred house sparrows in one breeding-season month. No other cause of sparrow mortality could improve on two out of every hundred. 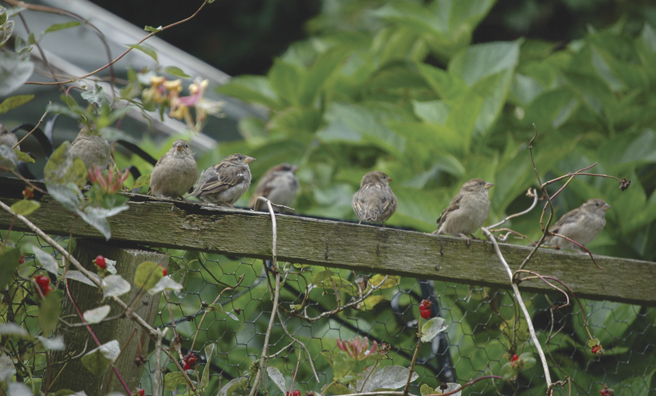 Even in September there were still new-fledged sparrows on the fence, wing-quivering and shouting for food. For a bird with the eyesight and discrimination and flight powers of the sparrowhawk, such an unwary sparrow is the easiest of targets. The hawk tribe knows the garden, makes regular but infrequent appearances, puts into effect a well-practised ritual and launches from a perch into a flat-out, ground-hugging approach, pursued by choruses of abuse from every bird it passes. The sparrows gather in an instant cloud that beelines for the honeysuckle, but the wing-quiverer is too preoccupied with where its next mouthful of food is coming from, and slow to react. The hawk angles up towards the top of the fence and the sparrow is probably dead from shock by the time the hawk hits the ground. The young hawk on the grass took her time. She worked with her back to the honeysuckle, a pointed indifference towards the affronted mob. Salvoes of tiny dust-coloured feathers scattered out from beneath one vivid yellow leg. Every few seconds the hawk paused to look up and all around. She stared at the window each time, the window where I stared back through the thin gap in the curtains. The beauty of such a bird is undeniable. I reappraised the first impressions of her plumage. She was a deep tawny brown in that early sunlight, splashed with creamy patches. She held her body horizontally and stood side-on to my window, so she looked long and lean and purposefully designed, from the blunt end of her darkly-barred tail to the vivid yellow cere above the dark downcurve of her bill. There was vivid yellow too in the eyes and the legs. Her neck and breast plumage flowed from vertical lines of dark markings into horizontal barring, dark brown on pale cream. She was as handsome as she was taut and tense. The honeysuckle still protested, its rage unabated. The hawk lifted suddenly, banked in a tight circle, climbed and passed the window ten feet away, with the sparrow-brown shapelessness tucked up against her tail. The whole thing had taken less than two minutes. Two minutes later, the sparrows were out on the fence and clustered around the feeder, and if any noticed the scatter of small feathers on the grass beneath them, it seemed to hold no meaning at all. I wondered if the moment had already passed beyond the reach of memory. The threat of the hawk is a constant of all their lives. Their defence against its appearance is practised and predictable (the hawk knows this, of course), the consequence of a lethal strike is the preoccupation of less than two minutes, then the thing is done and life rather than death takes over again, until the next time. I like sparrows, I like their confidence in human company. (That confidence is also seen in pigeons, which I don’t like. We all have our little prejudices.) I like their chatty conviviality. But I also like hawks. I like their aloofness, their capacity to astonish me with spectacle, the way they explode into a landscape. One of my favourite places to watch them is out on the broad back of Ballengeich Hill, a northern thrust of the rock that accommodates Stirling Castle, and with vast views out along the flatlands of the Carse of Stirling that end abruptly in an arc of mountains from Ben Lomond in the west to Ben Chonzie in the north. I love to watch them cruise that huge sky in climbing spirals and wait, lingering on the thermals, high and vigilant, and thrilling. For hundreds of years the inhabitants of the castle must have walked there with hawks and falcons on their gloved wrists. Falconry is older than most aspects of our imperfect relationship with nature. The sparrowhawk was trickier to work with because it is light and therefore limited, unless the falconer was particularly accomplished. I never much cared for falconry, although I can understand the appeal of it, not least because of its historical reach. Flying one from somewhere like Ballengeich Hill with its echoes of Stewart kings and that mountain skyline for a backdrop would be to strut a particularly potent stage where something from a timeless twilight world in which human and natural history intertwine might become tantalisingly within reach – almost within reach, because that bird that you fly is diminished by the fact that it does your bidding, that it has learned to be something other than just hawk. I might try and write a story about it sometime, and see how far I get. In the meantime, the hawk that mesmerises, the hawk that thrills, the hawk that turns my head and commands my admiration is the wild freewheeler of the thermals, and for that matter, the havoc-wreaker in the garden. And if from time to time it causes the garden to erupt and strikes terror in the bird-brain of every house sparrow within sight and sound of its appearance, and if it tumbles me from my bed before I am awake, then the sparrows and I will have to live with it, because that is just the way it is.